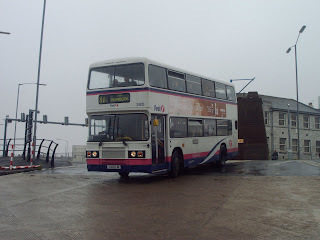 News came to me on a morning earlier this week that a bus driver, from Torpoint had saved someone’s life. Bus driver Carl based at the depot was running the first 81C of the day to Cremyll. Well on his way there (is not known where this happened) he came across at first what he thought was a rabbit, them being common at that time of the day. But at a closer glance he found it to be a small baby only around 10 months old. He stopped and got them on board and all I have found out from there is that he did return it to its parents. He may have known the family or someone on the bus knew who it belonged to. I will try and find out more details on this in the coming week. All I can do now is congratulate Carl on this achievement.